First of all, sorry for the lack of blogging lately. I've been busy. No, really. Sometimes I get a little free time on my lunch break or on the train ride to and from work. A few weeks ago, my neighbors had a birthday party for one of their two daughters. They are awesome people, and huge Harry Potter fans. I thought it would be fun to make the girls their own magic wands. It turned into a lot more fun than I expected. 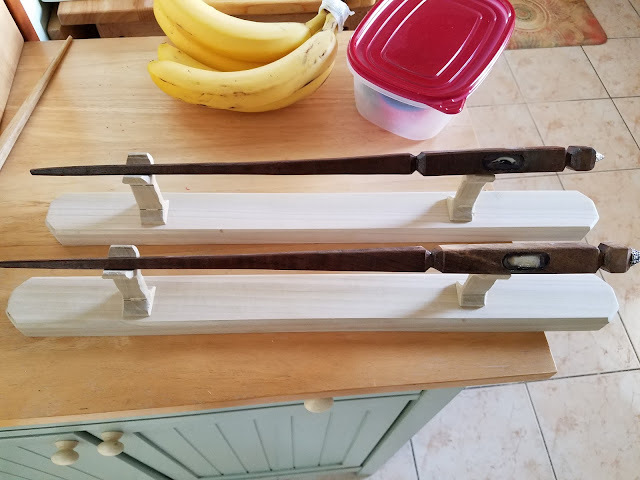 The wands now have stands, and a story to go along with them. The following is the story I will be giving to the girls with the wands. 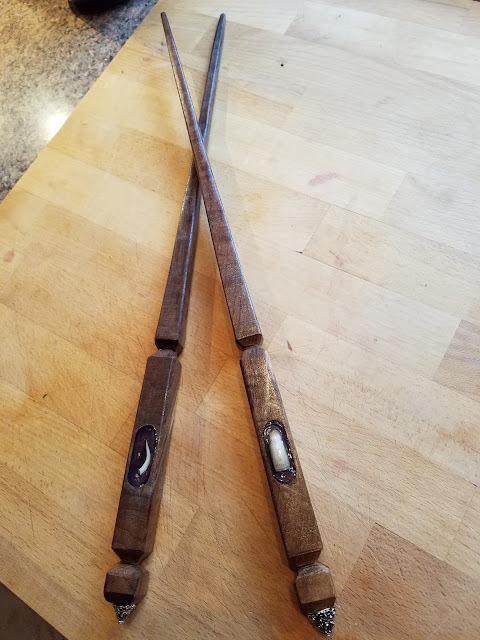 These wands are made of walnut with accompanying real alligator tooth and genuine rattlesnake fang in resin. No animals were hurt in the collection of these artifacts. However, I'm afraid the tree probably didn't survive. The stand is made of poplar. The story is made of my own nerdiness. Side note: If anyone wants their own very custom magic wand, email me or text or facebook. We can work something out. As you know, the wand chooses the wizard, or in this case, witches. It is my highest honor to inform you that the legendary Sister Wands have chosen you to be their masters. The Sister Wands chose only sister witches of great prestige, wisdom, cleverness, and particularly kind hearts. The wands have laid dormant in our museum for centuries. They have recently awoken and chosen to be the instruments of focus for your natural born magic. To understand the power and nature of the wands, first you must hear their story. Once upon a time, thousands of years ago when magic ran wild in the world, there was a mighty walnut tree growing in the center of a mysterious meadow. At the top of the tree, where one branch forked into two, a pair of merlins built a nest. In that nest there lived two hatchling sisters, Lozen and Tomoe. Lozen was the first to hatch, which entitled her to the most food. You see, the older stronger sibling always gets the bigger share. It was the way of survival, and still is. Lozen became the stronger and wiser of the sisters. Tomoe, however, quickly became the faster and more clever sister, for she had to compete for food. While Lozen spent her time reading the stars and observing the natural world around the nest, Tomoe invented new ways to trick her parents into giving her more food. She became quite good at it. Although the sisters often squabbled, they were as close as sisters could be. Lozen would happily give Tomoe half of her food, but Tomoe loved the challenge. And if Tomoe managed to win all of the meal, she would happily share with Lozen. However, they would both rather go hungry than to see their sister suffer. As their feathers grew in, the nest was beginning to be too small. The merlins would have to leave home soon, but first they would have to learn to fly. Lozen watched other birds and attempted to emulate their wing movements, thoughtfully considering each step of the way. Tomoe hoped flying would come instinctually. She knew she was a mighty bird of prey, or at least one day would be. She tried not to think on it, because the thought of soaring miles above her comfortable nest was frightening. One spring day Lozen practiced flapping her wings, which was painfully annoying to Tomoe. Each time Lozen’s strong wings went up, they had to come down. Most of those times would end with Tomoe being whacked on the noggin by errant feathers. Tomoe knew Lozen had her methods of doing things, so she tolerated it. Plus, when it came time to fly, Tomoe knew Lozen would help her with technique. Unfortunately, the movement attracted the attention of a hungry dragon from the east of the meadow as well as a rather peckish basilisk from the west. Tomoe formed a clever plan. “First, we must convince them that we are delicious,” she said. The dragon paused. It handn’t considered the taste of burnt feathers. “Then I shall eat your bones uncooked!” he rumbled and continued toward the mighty walnut tree. The basilisk paused. It didn’t know that merlins turned to crystal. Crystal was extremely unpalatable. “Then I shall eat your bones unpetrified!” he rumbled and continued toward the mighty walnut tree. Lozen the Wise and Tomoe the Clever had once chance to escape. As the dragon came from the east and the basilisk from the west, the sisters prepared. The hungry monsters were too focused on their prey to notice each other on opposite sides of the tree. The dragon pumped his mighty wings and drew level with the nest, as the basilisk slithered up the walnut tree preparing to strike. Lozen focused on the dragon. Tomoe focused on the basilisk. As the sisters prepared to leap, they had to trust each other. If one left too early, the other would get caught. They would rather sacrifice themselves than to live without one another. The sisters unfolded their mighty wings together for the first time. They jumped straight up while pushing the air and nest down with a powerful crack of wind. The branch holding the nest bent under the pressure as the sister merlins took flight. As it sprang back up a hungry dragon and a peckish basilisk bit the spot where the sisters had just been. The dragon’s tooth stuck in the east branch. The basilisk’s fang stuck in the west branch. They were both annoyed that their food had tricked them into not using flame nor petrification. A mouth full of tree was also enough to send them into a rage. Then they saw each other. The arrogant dragon assumed the basilisk was somehow at fault because the merlin hatchlings were prey, and prey can’t trick a predator. The haughty basilisk guessed the dragon had tricked him for the same reason. The dragon set loose a mighty blast of fire in the face of the basilisk at the same time the basilisk shot his stony gaze upon the dragon! The force of the contesting magic was too much for the walnut tree, the dragon, and the basilisk to survive. As the sisters soared higher and higher, they saw their home explode into a molten pile of petrified wood. The sisters had lost their home, but lived happily knowing they still had each other to count on. As for the tree, only two small sticks survived the battle. The east branch, still holding the magical dragon tooth formed the East Wand. 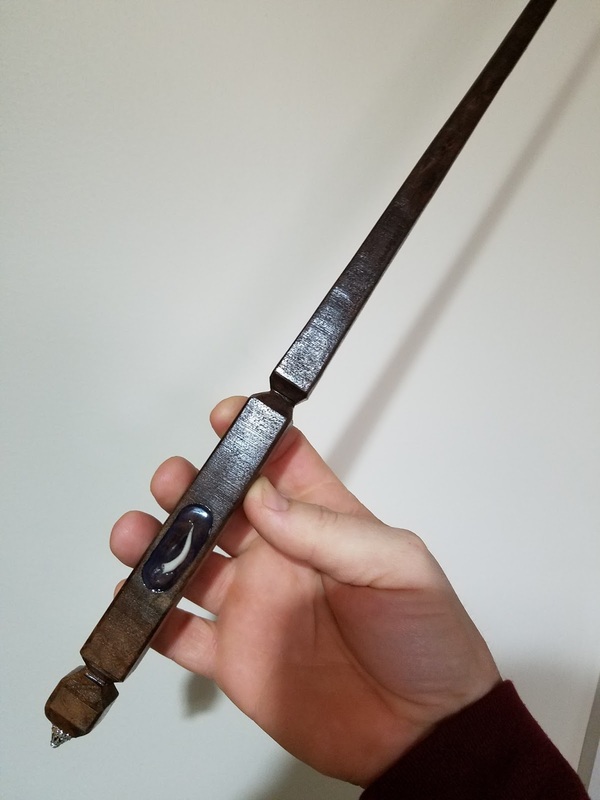 The west branch holding the magical basilisk fang formed the West Wand. Now you know the legend of the Sister Wands. Over time the wands found their way to many pairs of witches, and has seen hundreds of adventures. Each wand has its own powers, but they are most powerful as a team. So, wield them well, as I know you will. And while you’re practicing, don’t poke your sister in the eye.